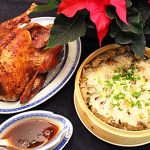 As a Chinese immigrant I am tempted to recreate the turkey by adapting a Chinese recipe. Unfortunately, Chinese techniques for making fowl, such as steaming, braising or hang roasting, are designed for smaller sized birds like chickens or ducks. Turkey I believe is best when cooked in an oven using radiant heat. Understanding how cooking techniques work is key to effectively fuse different cooking traditions. It is with this philosophy that my new cookbook, which will be published in the fall of 2015, was conceived. I’ve compiled a complete set of classic Chinese cooking techniques in this book with easy to understand instructions as well as lots of beautiful and clear pictures to illustrate them. 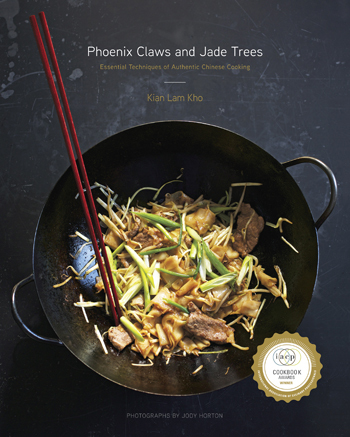 Master the techniques in this cookbook and I assure you that you will be able to reproduce authentic dishes from all the diverse regions of China. In the meantime, I have to come up with a new approach to our Christmas dinner. I’ve decided that I am going to stick to the tried and true oven roasting method for the turkey but I want to introduce some Chinese flavor. So a five spice powder salt rub is concocted to cover the turkey. The roasting is based on the standard method for cooking turkey in the oven without stuffing. I first seal the bird in a hot oven of 450º F for 30 minutes, then turn the temperature down to 350º F for the rest of cooking. I also baste the bird every 15 minutes with the pan juice to keep it moist and flavorful. 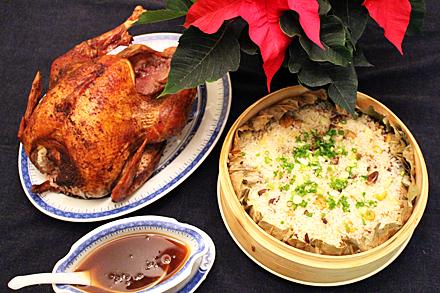 I purposely do not stuff the turkey because I want to make a sticky rice dressing on the side. This is where I really deviate from how I would usually make our holiday turkey. Sticky rice dressing is flavorful and really makes a great complementary side dish for the five spice flavored meat. In this dressing I make use of the turkey neck, gizzard, heart and liver that are often found with the raw bird. The gizzard and the heart are precooked with the neck in aromatic broth to make a stock for the gravy. The liver is not cooked in the stock, however, to prevent it from imparting a strong unpleasant taste. 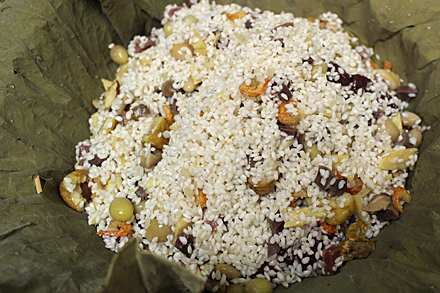 The sticky rice is steamed in a lotus leaf to add an extra earthy flavor. Finally, a gravy is made from the turkey stock and the pan juices. Using a flavor profile for a Chinese braised fowl, hoisin sauce and soy sauce are added to the gravy. It is then thickened with a flour and butter roux giving it the consistency of traditional gravy. Based on my knowledge of the Western roasting technique, Chinese flavor profile and fowl cooking techniques I reimagine our Christmas turkey with Chinese character. Right now I only hope my family will appreciate the thought and work I put into creating this new Christmas dinner. Merry Christmas to all. Put all the ingredients for the turkey stock in a stockpot along with 2 quarts of water and bring the liquid to a boil over high heat. Then turn the heat to low and simmer the stock for one hour. Strain the stock and reserve the gizzard and the heart discarding all the other solids. Preheat the oven to 425º F. Combine the dry rub ingredients and spread evenly over the entire turkey. Insert the scallions and the ginger into the cavity of the turkey. 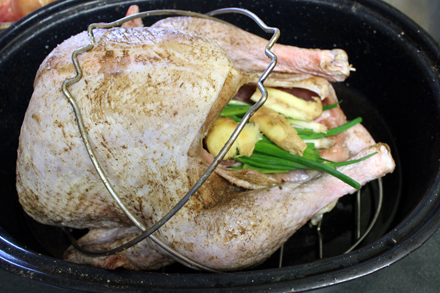 Put a roasting rack at the bottom of a large roasting pan and put the turkey on the rack. Pour 2 cups of water and the cooking wine in the roasting pan. Put the turkey in the oven and cook for 30 minutes. Then turn the temperature down to 350º F. Baste the turkey with the pan juice every 15 minutes and add extra water as the liquid evaporates. Cook the turkey for about 90 more minutes or until the thickest part of the turkey registers 160º F on a meat thermometer. Remove the turkey from the oven and transfer to a large platter. Cover the turkey with aluminum foil and let it rest for about 20 minutes before carving. Heat a wok over high heat until a droplet of water sizzles and evaporates immediately upon contact. Swirl the 3 tablespoons vegetable oil around the sides of the wok to coat it evenly. Add the garlic and ginger to the wok and stir-fry until fragrant or 30 seconds. Turn the heat off. 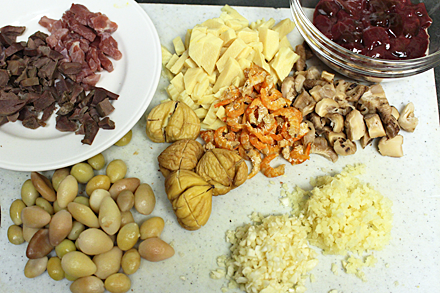 Dice the turkey gizzard, turkey heart, and turkey liver then add them along with the Smithfield ham, gingko, chestnuts, bamboo shoots, shiitake mushrooms, and dried shrimp to the wok and mix together. Drain the rice completely and add to the wok. Add the salt and pepper and mix thoroughly. Line a bamboo steamer with the rehydrated lotus leaf. Trim the edges so the leaf extends about an inch beyond the rim of the steamer. Transfer the rice mixture to the steamer and cover. Clean the wok, add about 5 cups of water and bring to a boil over medium heat. Put the steamer in the wok and steam the rice for about 90 minutes. Make the gravy after the turkey has been removed from the roasting pan. Strain the pan drippings and combined together with the turkey stock, cooking wine, hoisin sauce, and soy sauce in a saucepan. Mix the flour and butter together to make a roux. Bring the gravy to a boil then add the roux to the saucepan and whip until the liquid is thickened. Serve the turkey sliced thinly and covered with gravy. 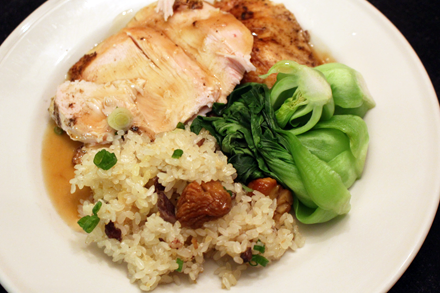 Accompany the turkey with the sticky rice dressing and some steamed bok choy. This sounds wonderful! If any family member complains, I will gladly fill their place at the table! Have a Merry Christmas! Thanks for the Christmas greetings Mindy. Best wishes to you for the New Year.